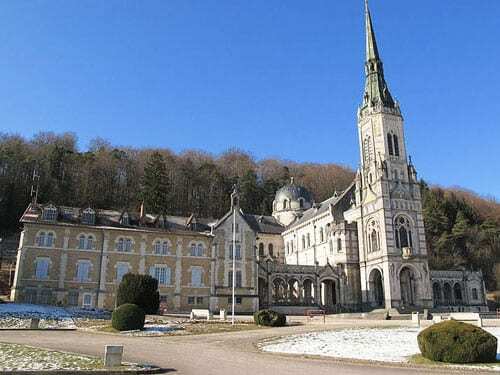 Domremy-la-Pucelle is a small village in Lorraine that became famous for being the birthplace of Joan of Arc. It was originally known as Domremy, a name that evolved most likely from Domus Remigius, an ancient Roman farm estate. The village changed its name to Domremy-la-Pucelle in 1578. Pucelle is an Old French word that came from the Latin Pucillella - unmarried girl (maid). Although small, Domremy was also a stop-over on one of the Routes of Santiago de Compostela. Would the regular presence of pilgrims have triggered Joan’s extreme piety? Joan was born around January 5, 1412, during the Hundred Years War, in a house next to the parish church. Every day, the pious girl went to pray in Sainte-Marie, a chapel built on a hillside that overlooked the village. When she was 13, she claimed to hear the voices of St. Michael, St. Catherine and St. Margaret; they encouraged her, on behalf of God, to liberate France from the English and to place Dauphin Charles on the throne. Years later and after months of doubt, the Dauphin finally accepted Joan’s intervention. The then 17-year-old maid managed to galvanize the French troops; she led them to liberate the city of Orleans, which the English had besieged for months, then steadily pushed the invaders back out of the occupied zone! Her final victory was to have the Dauphin crowned in Reims. The charismatic Joan became known as La Pucelle d’Orléans - The Maid of Orleans and her heroic acts contributed to reverse the course of the Hundred Years War. Tragically, the Burgundian party - allied to the English against the Crown of France - captured her in the city of Compiègne and sold her to the English. After a long trial marred by many irregularities, the judges declared Joan a heretic and sentenced her to be burned at the stake in Rouen on May 30th, 1431. The pope broke the trial in 1456 - tragically, too late for her! The trial of rehabilitation recognized her innocence and raised her to the status of martyr. The Church of Rome eventually beatified Joan in 1909 and Pope Benedict XV canonized her in 1920. The minutes of her trial portray a courageous and frank young woman with a strong spirit of repartee, modern qualities that obviously played against her! But that also explains why she knew, although being a young woman, not only impose herself among the French soldiers but also galvanize them! Joan of Arc remains an emblematic character of the History of France, and one of the country’s three patron saints (with Ste Anne and Ste Therese). France celebrates her on the 2nd Sunday of May, the date closest to the anniversary of the liberation of Orleans on May 8, 1429; La Fête Nationale de Jeanne d’Arc et du Patriotisme - National Day of Joan of Arc and Patriotism is an official national holiday instituted in 1920. Joan was born into a family of wealthy peasants who owned a house, modest by today’s standards, next to the parish church. She lived there with her parents Jacques d'Arc and Isabelle Romée, her brothers Jacques, Jean and Pierre and her sister Catherine. 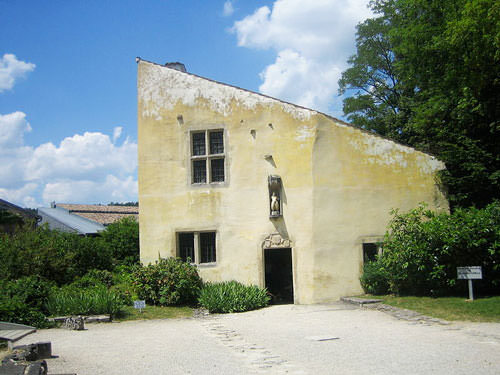 The Department of Vosges purchased the house in 1818, restored it and converted it into a museum. Joan’s bedroom, her brothers' and the cellar are open to the public. A tympanum carved with a 17th century coats of arms and a statue representing Joan kneeling, in armor, adorn the facade above the entrance door. The house was classified historical monument in 1840. The parish church, where Joan was baptized, was heavily remodeled in the 19th century. However, the baptismal font and sculptures are contemporary with Joan, and the 13th century tower is still standing! In 1929 Maxime Real del Sarte sculpted the bust of Joan of Arc in the southern transept. Le Dernier Soupir - The Last Sigh is in Carrara marble, bronze and onyx; its base contains soil from the site where the stake once stood in Rouen. One of the church’s pillars is adorned with a fresco that represents the martyrdom of St. Sebastian. It was painted in 1586 but covered with plaster at a later date and discovered in 1904 during restoration work. The church also boasts a statue of St. Margaret and a replica of the statue of Joan located in the cathedral of Winchester in Hampshire (UK). 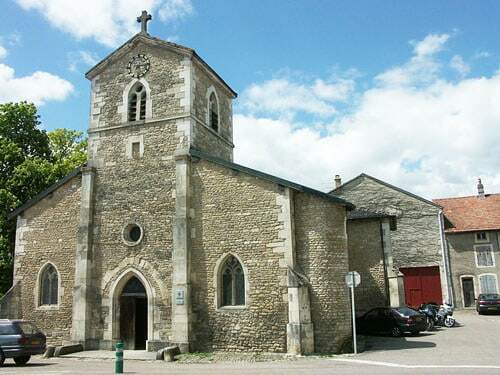 Heavily damaged during WWII, the Eglise Saint Remy was restored and classified historic monument in 1946; the last restoration dates from 2005. Joan said she heard voices as she prayed in the Chapelle Sainte-Marie, on the Côteau de Vignes, a small hill that overlooks Domremy-la-Pucelle. The Basilique Sainte-Jeanne d’Arc - also known as Basilique du Bois Chenu -today replaces this chapel. In 1881, the architect Paul Sedille designed the Monument National de la Reconnaissance Francaise à Jeanne d’Arc - National Monument of the French Recognition to Joan of Arc that stands in front.